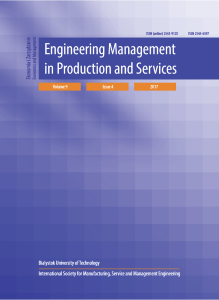 As of the beginning of 2017 the journal is published under a new name: Engineering Management in Production and Services. ISSN: 2543-6597 (print), 2543-912X (online). We are proud to announce that EMPAS has been evaluated for inclusion in Scopus by the Content Selection and Advisory Board (CSAB). The review of our title is now complete and the CSAB has advised that the title will be accepted for inclusion in Scopus. Publishing of four issues of the “Engineering Management in Production and Services” journal in English – tasks financed in the framework of the contract no. 710/P-DUN/2019 by the Ministry of Science and Higher Education from the funds earmarked for the public understanding of science initiatives. Prof. Joanna Ejdys, PhD Eng. Prof. Joanicjusz Nazarko, PhD Eng.